This small village has long been known for its pottery industry. Most villagers have gradually switched from making bricks and tiles to making pots and souvenirs for the tourist trade. The artisans employed in this hot, sweaty and painstaking work don’t mind if you come for a gander and a chat, though they’re happier if you buy something. The master woodcarvers, who in previous centuries produced the intricate detail that graced the homes of Hoi An’s merchants and the town’s public buildings, came from Kim Bong village on Cam Kim Island. Most of the woodcarvings on sale in Hoi An are produced here. Boats to the island leave from the boat landing at Ð Bach Dang in Hoi An (20,000d, 30 minutes). The village and island, quite rural in character, are also fun to explore by bicycle. Heading east of Hoi An, you cruise through paddy fields and follow the meandering river bank for 5km or so before hitting glorious golden sandy beaches. This palm-fringed coastline heads north all the way up to Da nang, and, if you choose your spot carefully, there are still some wonderful undeveloped stretches. The nearest beach to Hoi An, Cua Dai is subject to intense development and is probably best avoided. This is also where gangs of hard-selling beach vendors target tourists – even with an iPod and an eye mask, their attentions are impossible to block out. There are some seafood restaurants here (and the Zero SeaMile club), but better places lurk close by. The 5km of coastline south to Cua Dai port (where boats leave for the Cham Islands) is being totally transformed, as a strip of five-star resorts emerges from the sand dunes. Coastal erosion is a huge problem, and several of these hotels have seen opening ceremonies postponed for years due to vanishing beaches and resulting construction woes. The shore-side club Zero SeaMile (Cua Dai Beach; 9am-3am) really looks the part, with a large covered dance floor, stylish decor and even a pool. However, it’s really a tacky disco at heart and the food is poor. Free hourly buses connect the club with the Before & Now bar in Hoi An from midnight between April and September. ( 0510-392 7040; www.victoriahotels.asia; r/ste from US$158/247) This handsome beachside hotel adopts a French colonial meets traditional Hoi An design; check out the vintage Citroëns outside. Rooms are commodious, modern and immaculately presented, some with teak floors and jacuzzis, and all with balconies. There’s a 30m oceanside pool and good in-house dining. ( 0510-386 4800; www.hoianriverresort.com; 175 Ð Cua Dai; r from US$118) Offers classy rooms with hardwood floors and tasteful decor, many with balconies right over the river. It’s a well-run establishment, about a kilometre from the beach, and has a good restaurant, and massage and fitness facilities. A free shuttle bus connects the hotel with Hoi An. Just 3km north of Cua Dai, An Bang is fast emerging as one of Vietnam’s most happening and enjoyable beaches. The approach track is scruffy, but after you’ve parked and hit the shore it’s easy to see what all the fuss is about – you’re greeted with a wonderful stretch of fine sand, a huge empty ocean and an enormous horizon, with only the distant Cham Islands interrupting the seaside symmetry. More and more cool little beachfront bar-restaurants are opening here, and the scene looks set to take off. At the time of research visitors were not being hassled by beach vendors, but as An Bang’s star rises, this situation will probably change. Luckily the coastline immediately to the north – a glorious broad beach lined with casuarina and pandan trees and dotted with the curious coracles of local fishermen – remains pristine. An Bang is where the in-the-know foreigners gravitate. The area is much quieter in the winter months. ( 0126 944 4567; www.anbangseasidevillage.com; An Bang Beach; villa US$53-138) One of the best beachside locations in Vietnam, these wonderful cottages and villas are superbly situated between the coastal trees on glorious An Bang beach, close to restaurants. Each of the the six units combines modern (polished concrete) and natural materials beautifully, and boast stylish furnishings and lots of space. They’re serviced daily and breakfast is included. ( 0510-394 0000; www.thenamhai.com; Dien Duong village; villas/pool villas from US$525/845) About 8km north of An Bang and 15km from Hoi An, this beachfront temple of indulgence has it all: three pools (one is heated), butler service, vast villas kitted out with contemporary gadgets and private plunge pools, excellent fitness facilities and a world-class spa (try the four-hand Jade massage). Of course, all this comes at an astonishing cost, but at least service is both thoughtful and excellent. ( 0510-392 8244; www.laplagehoian.com; snacks/meals 70,000/130,000d; 8am-10pm) Simple-looking French-Vietnamese-owned bamboo-and-thatch beachfront place that offers delicious snacks and Gallic-style sandwiches such as tartine du pêcheur (open-sided sandwich with fish topping). Seafood options are always strong, as are breakfasts. (An Bang beach; meals 130,000-240,000d; 10am-10pm) Excellent new beachfront hang-out, very popular with Hoi An’s cool expat crowd, with tables overlooking the waves. The food is to savour, with lots of Med-inspired salads (try the crispy chicken or chorizo), pasta, bruschettas and mains that include a tuna tartare. There’s a full bar with lots of choices of wine. ( 090 644 0320; www.soulkitchen.sitew.com; meals 80,000-180,000d; 10am-10pm Tue-Sun, 10am-6pm Mon) Shorefront restaurant with a grassy garden and thatched dining area where the menu changes daily, but might include tuna carpaccio, seafood salad or calamari. You’ll find good wines, cocktails and mocktails too. (www.lunadautunno.vn; meals US$8-12; 11am-10pm) Fine beachside Italian with an authentic menu of antipasti, salads, pasta, meat dishes and the best pizza, from a wood-fired oven, in Central Vietnam. Living high in the mountains inland from Hoi An, the Co Tu people are one of the smallest, and most traditional, minority groups in Vietnam. Most men and women wear elaborate tribal clothing of intricately woven textiles, elaborate beads and the odd tusk or horn for good measure. Until quite recently, facial tattoos were common. 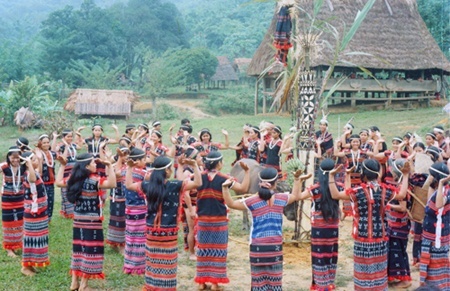 Their villages comprise of stilt houses set around a guol, a community building used for meetings, rituals and performances. One Co Tu settlement, Bho Hoong, has developed a fine community tourism project. and homestay (www.bhohoongbungalows.com; 2-day tours from US$150), allowing visitors to stay in the village. Co Tu guides have been trained and income is ploughed back into the area. This is a sensitive project and travellers are asked to only arrive via officially sanctioned tours (by motorbike or jeep), booked via the website. The village is simply not set up for random visits. A breathtaking cluster of granite islands, set in aquamarine seas, around 15km directly offshore from Hoi An, the Cham Islands make a wonderful excursion. Until very recently they were closed to visitors and under close military supervision, but it’s now possible to visit as a day trip, dive or snorkel the reefs, or stay overnight. In the last year or two the serenity of the islands has been compromised (on weekends and Vietnamese holidays) by boatloads of day tripping tourists from the mainland, so try to plan your visit accordingly if you can. It’ll have to be between March to September, as the ocean is usually too rough at other times. Only the main island, Hon Lao, is inhabited – the other seven Chams are tiny, rocky specks, covered in dense bush. Dip beneath the ocean and you’ll find a rich underwater environment, with 135 species of soft and hard coral and varied macrolife. The islands are officially protected as a marine park. Fishing and the collection of birds’ nests (for soup) are the two key industries here. Bai Lang, Hon Lao’s little port, is the main village (aside from two remote hamlets). A pretty, very relaxed place, its leeward location has long offered protection for mariners from the rough waters of the South China Sea. You’ll find its lanes are a delight to explore – the laid-back ambience and slow pace of life here are a real tonic for road-weary travellers. Tiny Bai Huong, a fishing village 5km southeast of Bai Lang, is an idyllic but isolated spot where an excellent new homestay initiative has been set up. Unsurprisingly divers and snorkellers are some of the main visitors. While the diving isn’t world class (visibility can be poor and overfishing is a problem), it is intriguing: five species of lobster, 84 species of mollusc and some 202 species of fish are endemic to the Chams. Dive trips and overnight stays can be arranged through dive centres in Hoi An, such as Cham Island Diving Center; a full-day trip that includes snorkelling, a short hike, lunch and beach time costs US$42. The only real sight in Bai Lang is a tiny, but very curious temple, whose modest appearance belies a fascinating history: it’s dedicated to the whales (and whale sharks) that were once abundant around the Chams. Locals worshipped whales as oceanic deities who would offer them protection at sea. When a carcass washed ashore, they’d clean the bones and perform an elaborate ceremony at the temple before giving the bones a burial. Sadly, whales are very seldom seen around the Chams today. A dirt track heads southwest from Bai Lang for 2km past a couple of little coves to a fine, sheltered beach, where there’s great swimming in azure waters, powdery sand, hammocks and thatched parasols that belong to the excellent Cham Restaurant. Unfortunately, during busy holiday times the beach here is packed with boats coming and going. Trails also sneak up into the forested hills behind Bai Lang. For the time being the Chams only have simple guesthouses (in Bai Lang) or homestays (in Bai Huong). ( 0120 237 8530; www.homestaybaihuong.com; per person 100,000d, meals 30,000-70,000d) Live with the locals in Bai Huong village. Visitors are given a bed with a mozzie net, and bathrooms have sit-down toilets and cold-water showers. Delicious home-cooked meals are available. The homestay program works with nine families, generating income from community tourism. Facilities are basic, little or no English is spoken by locals and there’s usually only electricity from 6pm to 10pm. Guests are often able to go fishing and trekking and can hire snorkelling gear. The project has helped fund education for Bai Huong’s children, including scholarships and a local library. ( 0510-393 0240; r with shared bathroom 220,000d) An excellent place with neat little rooms that have mozzie nets, TVs and fans (and a generator to power them during blackouts). Three meals a day cost around 200,000d. ( 0510-393 0007; r with shared bathroom 220,000d) Right by the whale temple, it’s tidy, clean and simple and meals are available (around 200,000d for breakfast, lunch and dinner). ( 0510-224 1108; meals 50,000-120,000d; 10am-5pm) About 2km south of town, Cham Restaurant sits pretty on a stunning sandy beach and serves wonderful Vietnamese dishes, including lots of seafood. Call ahead to book your meal. Public boats to Cham Island dock at Bai Lang village. There’s a scheduled daily connection from Ð Bach Dang in Hoi An (20,000d, two hours, 7am daily) that travels via the Cua Dai dock; foreigners are routinely charged more – as much as 100,000d. Note that boats do not sail during heavy seas. Bring a copy of your passport and visa, as the boat captain needs to prepare a permit. Tour agencies charge US$25 to US$40 for island tours, but most day trips are very rushed and give you little time to enjoy the Chams. You can walk from Bai Lang to the beach in 30 minutes, it’s another 40 minutes to Bai Huong. Local boatmen and xe om offer connections between Bai Lang and Bai Huong; the local rate is about 20,000d but expect to pay more.